Throw your pipes some shade. When the summer sun’s UV rays are beating down on exposed pipes, they can become weakened and damaged. Check exterior pipes for signs of damage and have them replaced if they show signs of stress. To protect them from future damage that might result in pipes bursting and causing water damage, paint them with a light-colored acrylic paint, or wrap them in insulation made for outdoor water pipes. Relieve growing pains. 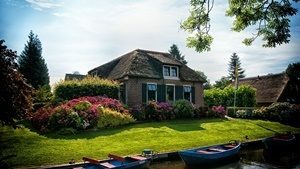 As trees and other landscaping grow in the warm summer months, their roots are expanding and can wrap around or break through pipes, invading your main sewer line and ultimately causing unwanted water to back up into your basement. Call a water restoration specialist immediately if you notice even a small amount of water backing up into your basement through floor drains or wall joints.It doesn’t take much before you’re dealing with a fully flooded basement that would require the services of a water restoration company, not to mention the mold danger that even a small amount of moisture can produce! Keep them in line. In periods of prolonged, excessive heat with no rain, the ground under your home can dry out and cause very small shifts in your foundation. Over time, these small shifts can accumulate enough to bring your water lines out of alignment and cause them to rupture, which could result in water-related damage that would require water damage restoration. You should regularly inspect the area around your home’s exterior and inside the crawlspace or basement for signs of shifting and stress. Give them a rest. 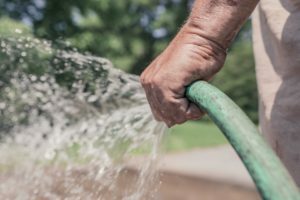 In the summer, garden hoses (especially if you have a pool) and sprinkler systems are in heavy use, putting more pressure on your pipes than most other times of the year. Keep an eye on your water lines during the times you’re heavily using irrigation systems, and don’t overtax your pipes by also running your dishwasher or washing machine at the same time. Limiting excessive water use can help you avoid water damage that might require water damage restoration. Take it one at a time. Summertime usually means lots of summer cookouts and get-togethers. Those good times at your house can mean lots of people using the bathroom as well as giving your garbage disposal an over-the-top workout. Make sure you’re running lots of cold water when you run your disposal, and don’t throw stringy vegetables or sticky foods down the drain. Also, plan to run sprinklers, dishwashers and laundry after your guests have all gone home. Keeping a close eye on overall water usage and making sure you don’t overload your disposal can help you avoid an unwanted water-related event while company is over. Summer is a season for celebrating all things outdoors. 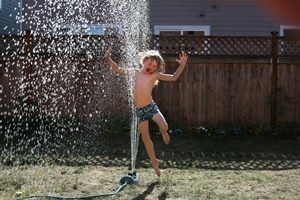 While you’re having fun in the sun, though, make sure you’re cool with your plumbing to avoid an unexpected water-related event like a burst pipe, backed-up sewer, flooded basement or other water damage that would require the services of a water restoration company.